This is a fabulous recipe if I may say so myself. Its an adaptation of my mothers famous Green Tomato Chutney Recipe only better as you can use up all of those fruits and vegetables that are sitting around at the end of the season, especially those giant marrows you’ve just discovered lurking under the leaves and no matter what your mix of fruit it turns out pretty much the same each time. Cant beat that in a recipe. The allspice gives it a spicy lift (without making it taste christmassy) and enhances the fruitiness and the mustard seeds add a savory depth. Its easy and you can adapt the recipe to whatever vegetables and fruit are available . The chutney will hold for at least 6 months. It also makes an excellent edible present-who wouldnt want a jar of homemade chutney to slather on their burgers , pies or sandwiches or to accompany a curry..
Place all the ingredients in a preserving pan or non-aluminum heavy bottomed pot. 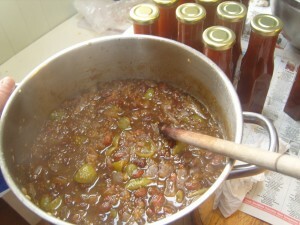 Cook over medium heat for 1 ½ – 2 hours until the fruit has all pulped and liquid has started to float on top of the chutney. Pour into sterilized jars and cover with sterilized lids. Serve chutneys with meats, cold cheese, pies, sausages, whatever! 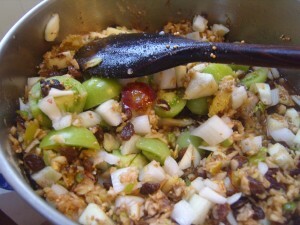 I always use a minimum of 2 lb of apples in this recipe to help to thicken the chutney. If there are wild blackberrys around I’ll also throw in a handful of these to give a nice purple color.I also use wild plums (pit removed) and a few crabapples if available. A good variation of this would be to add some ginger, garlic and a few tablespoons of treacle to give you a chutney reminiscent of an English-style brown pickle. YOOOOOOOM! And the chutney and the raw bars too!!!!!!!!!! WANT ALL OF IT, but esp the green garden dressing!